Some of the group met with North Shropshire, Bristol and South Wales Sabs to sab the Cotswold Vale Farmers’ Hunt at Flaxley (N. Shrops report to follow). Other sabs went to the North Cotswolds cull zone on early morning sett-checking patrol. The North Cotswold and the Heythrop hunts were both due to meet within spitting distance of one another, as is commonplace on a Saturday. In fact it is not unknown for both packs to run into one another, a fox that escapes from one hunt could easily find himself running into (or from) the other soon after. It is also known for many setts to get mysteriously blocked when either pack is out. This means being out early and checking as many setts and artificial earths as possible starting, preferably, pre-dawn. We have seen attempted sett-blocking as late as just before the meet at 11am but really it’s an early morning job. Setts were found blocked and were promptly unblocked for the benefit of both foxes and badgers in North Cotswold country. The Heythrop were watched and filmed from afar near Condicote without them knowing. Eventually after getting something to eat in Stow (after walking from 06.30 in the morning to 13.30) Heythrop stalkers discovered us as the pack hunted through Donnington and they second horsed. This then means being shadowed closely by designated hunt supporters until the hunt finishes, but only if they can find us all) ;P At least they were kind enough, when asked about the blocked setts, to quickly drop the North Cots in it and say it would have definitely been them! Not much else to report other than they did hunt into the dark through Kineton Hill farm and Upper Swell but no way of telling what the fate of that fox was. Gary Morgan, the terrierman, made a death threat to the sab driver as hounds ran by in full cry. More setts were checked once the hunt had packed up and found to be untampered with and active. Busy day today Friday 18th November 2016 in what was a whistlestop tour of the Gloucs cull zone. Badger setts were checked early on as well as throughout the day. First of all we came across a line of beaters and some guns blasting at the helpless birds at Hartpury. A fox ran away from the beaters and to safety. A gun was approached and all of them, to their credit, broke their guns and left the scene very quickly. Then on to the Ledbury who had just moved off from Corse End Farm and were on top of Limbury Hill. They did find something but scent appeared to be poor. They then headed west and on to Collin Park Wood where the pack split. Then through Sladbrook and across the road to Downview Coppice where a sab slowed them down on one fox. They went around Gadfield and finished up in Gadbury Bank. This wood is on top of an ancient monument of national import and is owned by the Ledbury hunt, badger setts in the past have been destroyed by having staves rammed down them. The Ledbury were keen to be in the badger cull. Mark was observed trying to put up a fox but to no avail. He and his 3 charming terrierman chums (all of whom had their faces covered) then got all defensive about a lone female being present whilst they “exercised” the hounds and were a bit rude and pushy. We think that they might, just might, have been up to no good up there, as it grew dark they left and packed up at Pigeon House Farm. Tuesday 15th November 2016 and still in the Gloucestershire cull zone we sabbed the Cotswold Vale Farmer’s hunt from Norton. At Norton hill we ran into the gruesome twosome hunt stewards from the Bicester and Whaddon Chase hunt whose cutting wit and ermmmm “humour” kept us entertained all day……not! As these 2 well known sab groupies tried to push one small female sab in a ditch hounds hunted a fox in front of car sab and other foot sab who managed to halt them with use of gizmo and holloaing. Jason Warner MFH was sprouting some nonsense about how his horse was frightened in order to mask some very dodgy goings on with a man with a sack hiding in the woods and some known miscreants (who also happen to be involved in the badger cull) trying to cover up for him by saying that he was answering the call of nature. The sack was found later……but they’d put a log in it to try and wind us up. 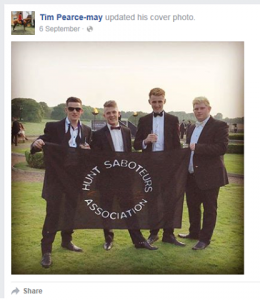 Nick Hodges, terrier man, spotter for badger shooters and ex-police officer (left Glos pol under a dark cloud….so it is said) was also lurking about. The hunt ran away and packed up leaving us with the Bicester boys trying to find all sab vehicles and boasting about how they have tried to intimidate elderly hunt monitors. Well done to the Bicester Boys for being at their most incompetent today, hardly sticking with us at all in land, getting flustered when asked to push us around and then managing to push us away from the footpath – there’s a local landowner unhappy with the hunt now because of you guys – thank you to the lady who understood why one sab had to traipse down the side of her garden having being forced to go that way by Tommy boy! The Ledbury met at Hollin’s Farm, Pauntley yesterday Monday 14th November 2016. Sabs were in attendance first thing sett checking in what is part of the Gloucestershire badger cull zone to make sure that they were not sett blocking. We were in prime position as the hunt moved off watching them draw blank in Collin Park wood. They then rioted on a hare but stopped the hounds quickly showing that they can do it if they so wish. Several smaller coverts and a field of roots at Pauntley Court were drawn before they crossed the road and headed north drawing blank again and again with a foot sab having very little to do except keep a watchful eye. After Ryton Coppice and Cobhill Rough they did start hunting as it turned dark but then called hounds back. We are also getting some really good intel from members of the public phoning in hunts and what is really great is that people are taking cameras out and using their initiative in challenging hunts. We can’t get to every meet we are given but the information can be passed on to other groups and local activists as well as anti hunt landowners. Please keep the info coming in. Our group is out 3-5 days a week during the hunting season and that is on top of a gruelling 7 solid weeks of cull sabbing where we were out every day and night (Gloucestershire, Herefordshire and North Cotswold zones) and an entire summer of sett surveying across 3 different cull zones. If you can help us our paypal account is paypal.me/threecountiessabs and we appreciate every penny that people have donated since we formed a group in 2012. Thankyou for your continued support! Yesterday we teamed up with Three Counties Hunt Saboteurs along with Bristol Hunt Saboteurs and South Wales Hunt Saboteurs and attended a meet of the CVFH. On arrival, we were met by two police cars, one of which sped past with lights blazing. What could of happened we wondered? Turned out it was just the hunt wasting police time by calling in reinforcements because of a few sabs turning up. After this time wasting tactic, the hunt made a run for the hills and were met by a pincer movement of Bristol and South Wales sabs on one side, and Three Counties and North Shrops on the other. After mooching about for quite some time, they managed to flush a deer before the hounds went into cry, moving through the wood with “Scatterpack” hunting them on close behind. Clearly, he doesn’t quite understand the principle of “lawful hunting” so just to make sure there were no unfortunate accidents, we were more than happy to help him out by splitting the pack and taking them to safety. He then spent some time gathering his hounds back up and whilst we did offer to help him out with a few horn blowing lessons, free of charge obviously, he didn’t seem to keen on the idea. Moving off, the hounds immediately picked up and chased a hare whilst a rather red faced “Scatterpack” desperately tried to get them back. Luckily for the hare, another red coat came to his rescue and the hare ran free. Then it was a mad dash for the river hoping to loose sabs but to no avail. Bristol and South wales soon turned up and sent him scurrying back in the direction of the meet. They weren’t too keen on making a comment when asked about this and tried to escape from our questions by popping into a field on a public footpath ( naughty naughty). We were more than happy to point out the error of their ways and eventually they admitted defeat and skulked off. With the light fast fading and with most of the field giving up and going home, they had one last ditch attempt to satisfy their bloodlust behind the meet before also sloping off back to the meet and home. A good day for us (not so much for poor old “Scatterpack”). Never mind, ey! And now for something a little different… we posted back at the end of May that we had been along to the Ledbury Hunt ball – Fox Rocks – which was being held this year at Bredon School (which also hosts hunt meets during the season). The setts around the area were targeted in the last 4 years during the badger cull in the ‘Gloucestershire Zone’ so we went along both to remind the Ledbury Hunt that we are still about even out of the hunting season and to remind the local pro-cull people that we’re out and about keeping an eye on badger setts (many of which are targeted year round by farmers, gamekeepers and, of course, the hunt themselves). While some of us went off to check setts and walk the footpaths in the area, one of our sabs remained with the vehicles at the entrance of the school (we can’t leave our vehicles near this lot – we’ve had tyres slashed and keys stolen out at the hunt before) and she was just answering a phone call when former Bredon School pupil Tim Pearce-May (who was whipper-in at the Ledbury Hunt until this season) of Mill Farm Hunter Hirelings stole a HSA banner from the vehicle in front. Now it’s not something we’d usually report to the police, but we thought our good mates over at Black Badger Printworks might be up for making us a new 3C banner to replace it and getting some monies in return, so we gave it a shot. With former Bredon School pupil Oscar Bates (terrierman and badger shooter) helping the case along by posting up a picture of the lads with the banner at the ball and the sab having filmed the theft, Timmy-babe admitted it and handed over the money last week as part of a community resolution. New 3C-specific banner coming up (they really help in drawing attention to our group at events and therefore helping to raise awareness and funds). With Bredon School holding an open morning for prospective new pupils later this month, we wonder whether parents would be happy to know how some former pupils of this school have turned out, that the school hosts hunt meets for a hunt repeatedly caught illegally hunting and whose terriermen block and attempt to dig-out setts and who have also complained in the past that the hunt have trespassed over their land on days they had not authorised them to be there. We joined up with our besties Three Counties Hunt Sabs along with Bristol Hunt Saboteurs and South Wales hunt sabs for a meet of the Ross Harriers and Leadon Vale Bassets. The day started off in its usual manner with Owain skulking about in beet fields. Now, what with his shocking incompetence, you would think he would steer clear of danger zones like beet fields but no. And lo and behold, a very lucky little fox ran straight past sabs closely followed ( a matter of feet) by several hounds. This happened right in front of the field and sabs with cameras and the hunt were forced to rate the hounds. Owain then spent some time hiding up in a wood, with the hounds going in and out of cry. If you are on a trail Owain, Why are you spending so much in woods with no “chase” for the field? On leaving the wooded area, hounds moved through another beet field and on to a ploughed one, picking up and hunting a hare with no members of the hunt attempting to stop them at any point. Thanks to some good work by sabs on the road (sort of) the hare was given a good chance and with other sabs calling them off the line with horns, the hare was long gone by the time Owain got his lazy backside back to the pack. As foot sabs tried to leave the land as requested, the hunt resorted to their usual tactics of violence and one female rider “Thea” rode her horse at speed through eh group, knocking one to the ground. This was a deliberate act as she can be seen on our video lining her horse up manoeuvring it into position. The hunt briefly crossed over the road, getting straight onto another line but with sabs on both sides, they soon lost it. As they moved onto the road, one rider who was clearly not confident with his mount, lost his temper due to the horse playing up and after whipping it twice on the body, hit it around the head with the handle of his crop. When challenged on this, “Thea” (from earlier) became abusive and said it was none of our business. On being told to shut up, she went crazy and attempted to ride one sab down. This attack is also on video but for legal reasons we won’t be posting the video for now. The hunt moved back into the area they had spent most of the day in, and whilst watching them from a gate, Terry, joint master turned up with another hunt supporter and proceeded to push and shove sabs about, insisting they were trespassing even though they were on a public road (not too bright is our Terry). He then smashed a journalists camera (on film too ). Not his best day ever! With the hunt moving off, we headed back past the meet and on taking a sneaky peek behind the meet, came across the bassets. We tried to make polite conversation with the whip but funnily enough, he wasn’t too chatty when we asked him how he could be hunting a false trail when we had been in those fields most of the day and had seen no trail layer. They ended up giving up when it got so dark, they could barely see the hounds. 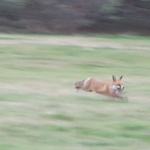 An eventful day with at least one hare and one fox given a fighting chance thanks to sabs being there. On Saturday 5th November we met up with our close friends Cirencester Illegal Hunt Watch to visit the (Duke of) Beaufort Hunt at their opening meet. Soon after the hunt left the meet at Worcester Lodge, a couple of 3C Sabs drove round to intercept the hunt and spotted a couple of quadbikes parked up in the corner of a field. With others on their way round to find the hunt, we stopped to check it out and were soon joined by three more quads, two of which also drove into the field. As a sab passed these quads, one man was on the phone, we think warning the others that sabs were in the area. As the sab reached the original two quads, she could hear people within the wood and walked in to find a number of people with spades at an artifical earth. We are unsure as to whether they had flushed a fox out of the AE as hounds were soon heard in full cry just a few fields away or whether they were attempting to get to a fox. We will certainly be keeping a closer eye on this area in the future! If you can support our work at all, we’re out 3, 4 or 5 times a week, often splitting the group in order to get to more than one hunt – Saturday saw other 3C sabs out with the Ross Harriers and Leadon Vale Bassets at their joint meet – and it does end up costing us a lot of money. We’ll be out there regardless, but if you’re able to chuck us a few quid to help out, it’ll be money well spent! WARNING! You may need mind bleach after watching this. Well the Ledbury had their Opening meet on Friday from the Corse Lawn Hotel and spent most of the day trying to avoid us….unsuccessfully The terriermen were unable to escape our watchful eye and we found these 2 lovelies hiding in a field. We would treat you with some of the lovely specimens found at the Bicester Opening meet on the Thursday but that would just spoil everyone. Following the wonderful video posted earlier of the Ledbury terriermen on Friday, we thought we’d post something a little more inspiring. 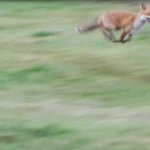 Here are some of our screenshots of a fox making his escape from the hounds. We’d have been in the right place at the right time if hounds had given chase, but despite an interest in the area he ran from, hounds missed his line and he got away without anyone else spotting him. “It’s not often we get to go out mid-week, but we managed to fill our landy and head to Apperley this morning where the Cotswold Vale Farmers Hunt were having their opening meet of hunting season. Joined by a sab from Three Counties Hunt Saboteurs we followed the hunt from the meet and watched as they tried to create a huge distance between us and them. In reality, it meant most of the riders and support were left scratching their heads as the huntsman took off. Knowing the area well we figured where the hunt would head and we came up trumps. We watched two foxes running for their lives despite hunt supporters hollaring to the huntsman that they had been spotted. We covered their scent with citronella spray and the hounds came nowhere near as a result. We stayed close monitoring the hunt for the rest of the day and even caught the hunts terrier-men armed with spades and terrier at the edge of a wood getting off their quad. Upon spotting us they masked up and sped off at a high speed. Up to no good boys? !